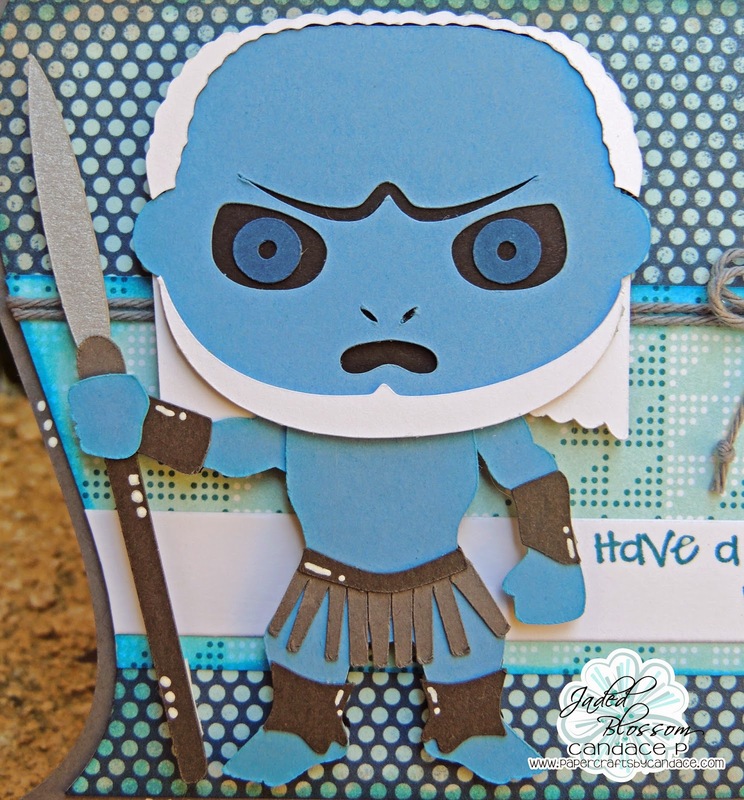 Paper Crafts by Candace: Game of Thrones Blog Hop!! Our blog hop is sponsored by Jaded Blossom and SVG Cutting Files, so sit back, relax and enjoy the amazing projects we put together to help us all get ready for the Season 4 Premier! There are only THREE stops on this hop...its a MINI Hop!! But in order to claim your files, you must follow the guidelines we have stipulated below! And now for my project! I couldn't do just one, so I actually have 3 projects!! 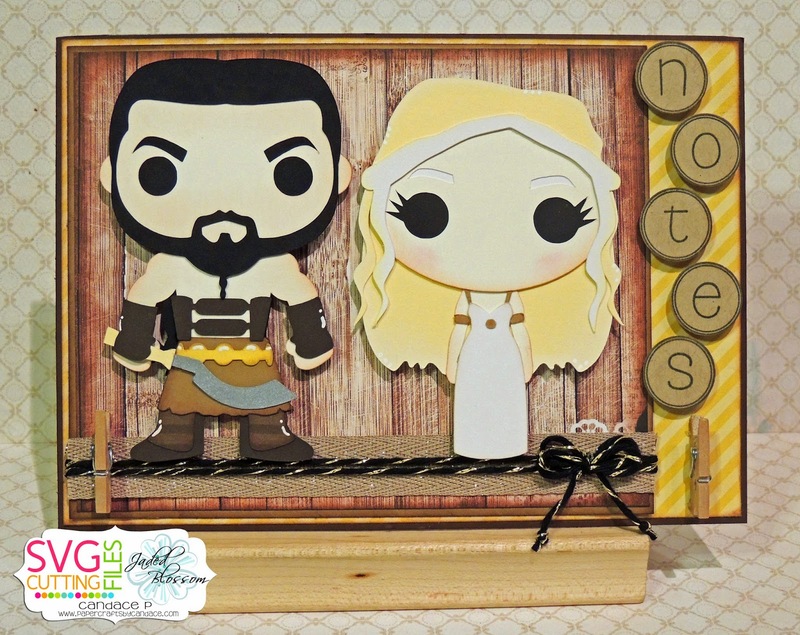 First Project: KHAL DROGO AND KHALEESI!!!! This is a magnetic note holder. This is 5x7 inches and has magnets on the back. Its currently on my Fridge!! I used Jaded Blossom's Alphabet Candies to spell out notes. Here is a close up of the two! I love love love how this turned out!! And you cant have the Mother of Dragons without at least ONE of the dragons!!!! 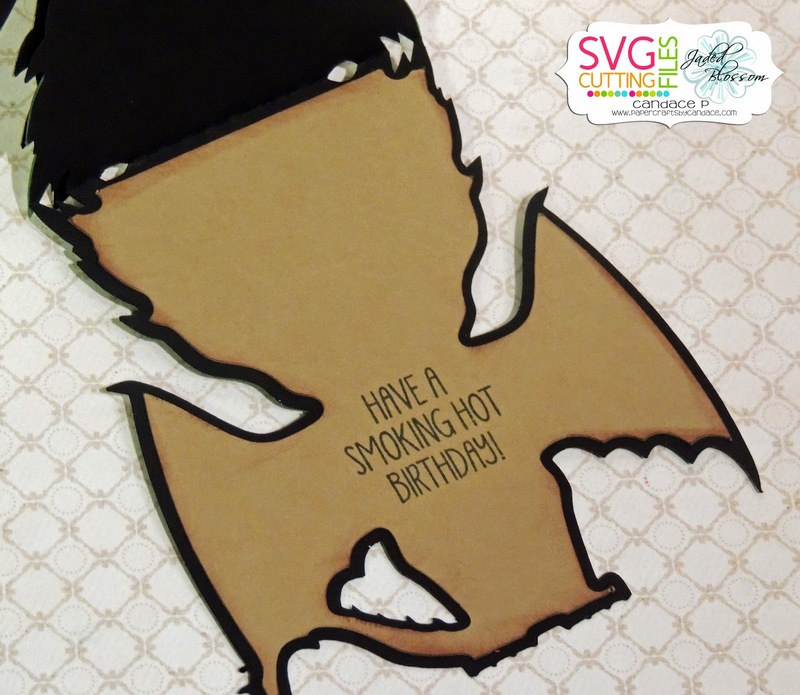 I made a shape card using the Dragon SVG!! I don't want to toot my own horn or anything but.. I think it turned out pretty awesome!! I embossed the inside of the wings and used a chalk ink stick to shade the face. On the inside the sentiment is from Jaded Blossom's "Knight Bites" which is CURRENTLY ON SALE for only $10.99! This month only! 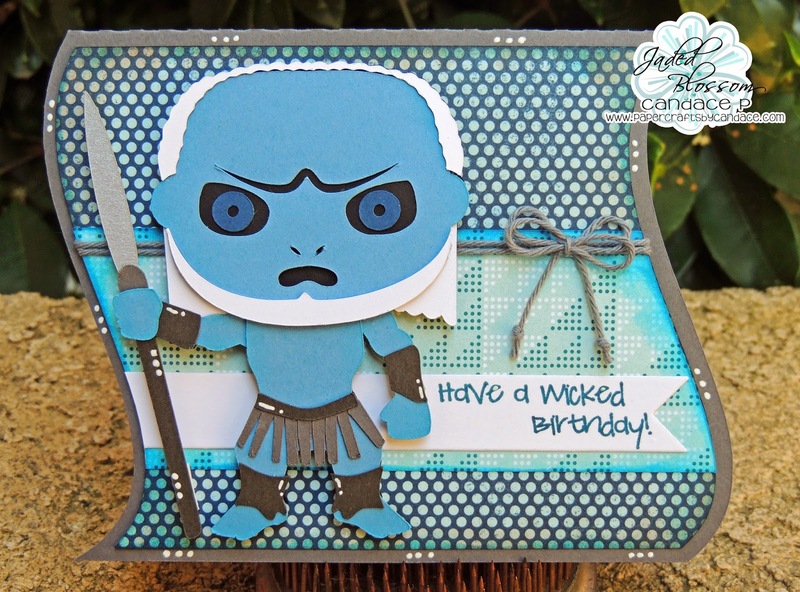 And my third project: A White Walker! Looks awesome right? He came together perfectly! Sentiment is from V is for Villains and is stamped on the small flag die from Jaded Blossom. Here is a close up! At the end of the hop you will be redirected to REQUEST your files. DO NOT SKIP AHEAD, DO NOT miss FOLLOWING or COMMENTING ...you must do this to qualify! Next up on the Line Up is Gigi! Great Cards Candace! These files are amazing! mini hop - but not mini content..well done girls.. These are amazing...can't wait to make some projects with the files!!! Ok I am beginning to feel old and left out. 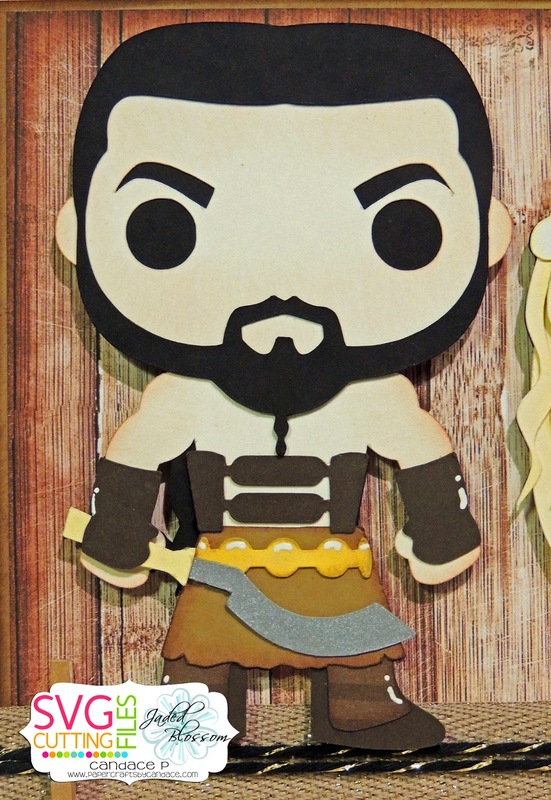 Who is KHAL DROGO AND KHALEES????? Thanks for letting us play today. WOW you ladies are awesome, I love it. So awesome. Love alk the projects. Great shading in the dragon. TOOT YOUR HORN! You did fabulous! Fantastic card! I love the expressions on the characters' faces, and I especially love that dragon! Loved all of your projects!! Candace, I don't know a thing about this show.....but your cards and note holder are amazing!!!!! OMG! You did such an awesome job on these and I love that dragon! Cute!. I love the dragon. What amazing projects, love them all! Toot toot! Your dragon rocks!!! OMG, I love these! You did amazing on all of them! Love, love, love these!!!! Best hop ever!!!! Now to finish the hop, order my loot crate (it is dragon themed this month) and get to crafting while I wait for the GOT to come back on. Thanks for the fantastic hop! I think you have every right to toot your horn - these projects (especially the dragon) are fabulous. Love them all!!! These came out GREAT! LOVE LOVE the dragon. Great job! The note holder is a great idea, and I LOVE your dragon, and so will my son! Amazing files but especially like the magnetic note holder. Really clever!! Not a GOT fan but I must have the dragon!!!! Wow! What a awesome job! Just amazing! Wow. Very cool. Love all the details. Wow awesome job! my fav is the dragon! These are too great!! Love your projects, so fun that you are doing a Game of Thrones blob hop, my husband and I are big fans! These are so great! I just love Game of Thrones!!! Wow! Love these projects - I was looking forward to this mini-hop. Love these. I agree with you. The dragon is awesome! Thank you for putting so much of your creativeness into your projects. I know nothing about Thrones, but these are so cool! The dragon is amazing! Love the shading! All you project are great! So darn FAB...LOVE them all...this is my FAV show!!! WOW Candace!!! These are all AMAZING!!!! I have to admit I have not seen the show but will have to check it out! Thanks for sharing and have a GREAT Wednesday! Love the cards! Honestly I have never seen GOT but I love the fantasy element! Awesome. Super Great job!!! Thanks for sharing. Stunning!!!!!!!!!!! I love all three projects!!!! Sqeeeeeeee!!! 1st stop and am in love with the cards!!! These are so awesome! You did such a great job creating these projects! these are wonderful. There are so many family and friends that would love a card like this. Love it. For my boys. I love Game of Thrones! These are so cute! Ok all of ya'll's hops are fantastic but this one has me the most excited!! Flipping fantastic job!!! Amazing - just amazing. I really need to start watching this show again, but it's so NOT KID FRIENDLY! I have little mommy TV time anymore. Holy Moly how cute are these files?!! As always you ladies do such an amazing job making these hops spectacular. Awesome job! Wow three awesome projects. Can't wait to play with these. Thanks! I have never watched the show, but I've heard its great - maybe I'll have to start this summer when my shows are done for the season. Nice job on these, they are cute! Oh my goodness! These are fabulous!! Love the sentiments, colors and patterns you used!! What a fun little hop! Those are amazing. You did a wonderful job. These are so amazing!! Love all your projects that you made! Wow - as usual great projects!!!!!! Wonderful!! I love the show *and* your cards. Thanks!! So many ideas come to mind! Great job! 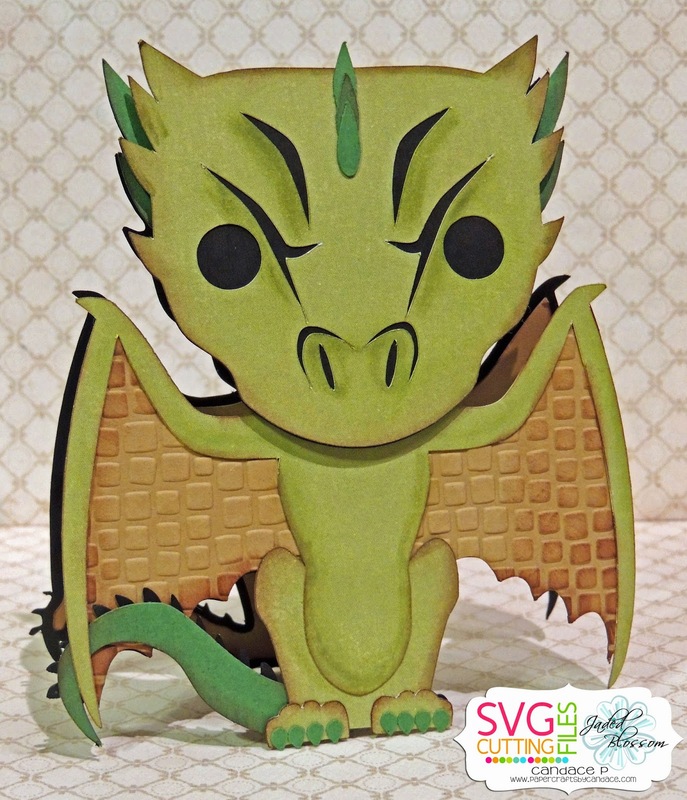 all super cute.. but the dragon is amazing! I am not familiar with the show yet but I love love the dragon! Great work. OMG! Totally cool projects!!! LOVE them all!! These are awesome! Love the dragon!!! these are super cute! and you are right the dragon is AWESOME! You should toot your own horn. These are fantastic. These are amazing! Thank you so much! I LOVE the Dragon!!! I really want to make that one! Love, Love the Dragon and your "scary" white walker - great job. Can't wait until this weekend and the next book in the series. Seriously AMAZING job! Couldnt even PICK one if I wanted to..they all look soooo awesome!! Love you made it a magnetic board so you can get use out of it..I should have thought of that!! LOVE IT!! This is so cool I love this show! You did a great job on these now I have to get that stamp set! We started watching Seasons 1 - 3 so we can start in with 4. Love these designs. Those are GREAT projects! I just luv your hops! TFS! Love your projects!! Thank you for sharing. Awesome job!!! I especially love the dragon's wings! Your projects are AMAZING Candace! I SO LOVE that note one is magnetic and on your fridge! Hehehehe! The dragon card turned out AWESOME and I love the white walker too! Super job on all! Love love love the dragon! Love these, that dragon is awesome, can't wait for it to begin!! SO awesome! I love them all! I love all of these, especially the dragon and Kaleesi, since she is my favorite character. I would love to see more GOT blog hops. Love the cards! Thanks for sharing! Thank you so much for letting us play. 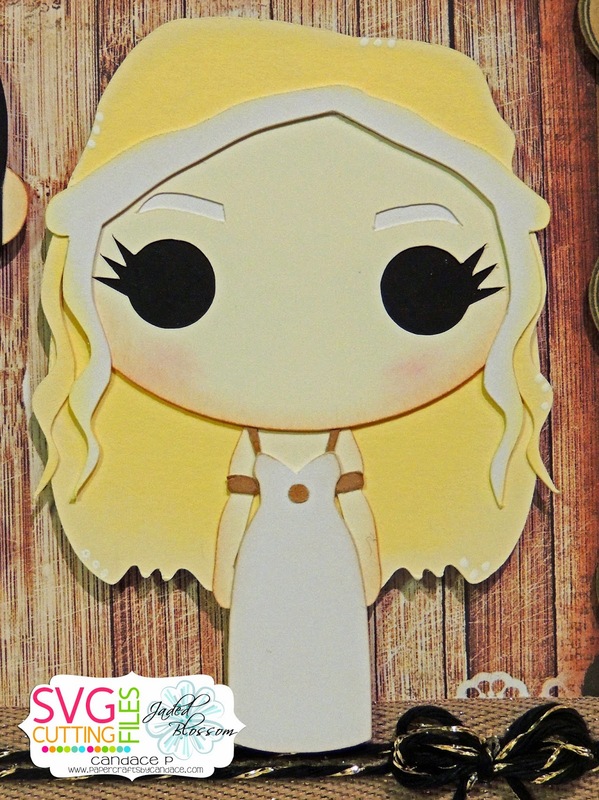 Love Game of Thrones and these are adorable! So excited for the premiere! Great Hop! I'm really going to have to learn to do shadowing better. That dragon is AWESOME!!! So cool! Can't wait to make them! I just love the dragon card. Nice job. Awesome projects! Loving the dragon card. It's OK to toot your own horn! they came out pretty cool! awesome but I think the dragon card is my favorite! Oh my goodness, these are more awesome than I could have imagined. LOVE all three projects. What great fun. I'm a huge fan of Game of Thrones. These are wonderful files. Great files. Thanks for sharing your talent! Great ideas for cards. Thanks for sharing. I adore the dragon. Super cute! Amazing projects!!! Love them all!! OH this is soo cool!!! Love it! The Dragon card is fantastic!!! I love these!! Too cute! Fantastic projects! 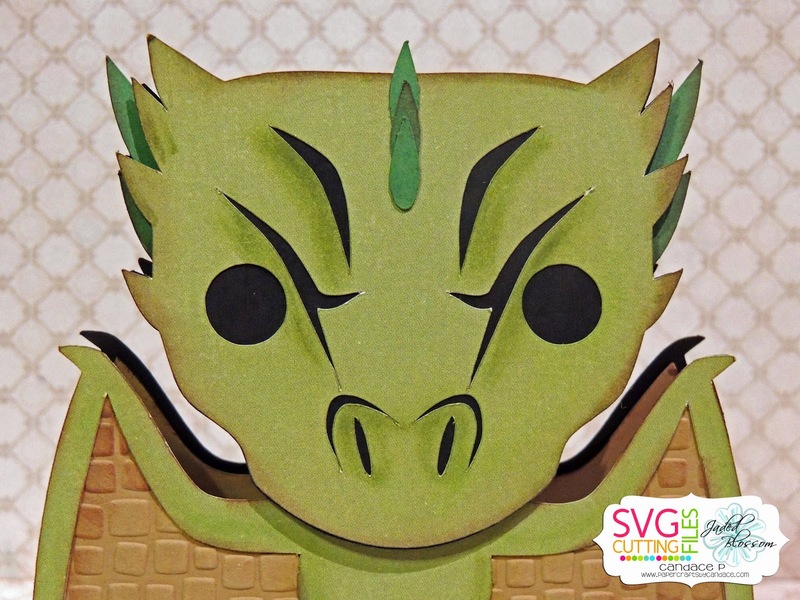 Love the embossing on your dragon! How FUN!!! I am loving these projects an learning about the Game of Thrones as the same time. Great job on the cards. Love the note holder and the dragon is awesome!! Love these, especially the dragon!! Great job!! Haven't watched the show, but I love, love, love the dragon! Thanks for sharing! I love all your projects but I have to say that I love the dragon the best! So cute!!!! OMG!!!! These are awesome. I can't wait to play with mine. TFS! Wow, you did an awesome job. I really love the dragon, in particular, and how you embossed the wings. How cute! I adore the dragon card! Love These!! You did a great job! Holy cow these are stunning. Never thought of doing GoT cut files, but hubby is an addict! So clever! Amazing job! I love the dragon. I haven't watched Game of Thrones yet *gasp* but I've been wanting too. That dragon is absolutely adorable!! Awesome files LOVE how you did the card with the Dragon.